We’ll be picking up our little family member in three short days! 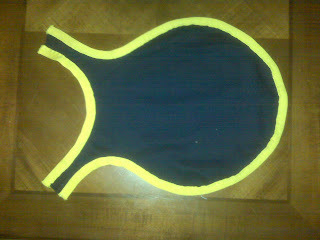 Huib had some time last night to make our puppy’s first training jacket. we still need to attach the straps and get “Service Dog In Training” embroidered on it, but here’s what it looks like so far. When the jacket is completely finished, I’ll post another picture, but that may not happen until Friday so you’ll get to see puppy wearing the finished product. I hope everything is going well with puppy pick up. Travel safely.